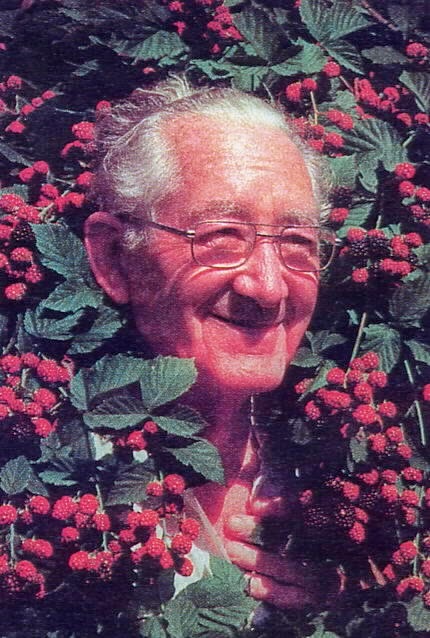 You've probably seen the above picture of Tom Doyle in magazine advertisements for the thornless blackberry he developed, and which his family still sells (Doyle's Thornless Blackberries, Inc.) I enjoyed reading Mr. Doyle's biography at the web site. He was clearly a hard-working, entrepreneurial man. He appears to have been a family man too. And he was an "avid gardener all his life." He was my kind of guy. He became well known nationally as the "plastic man" and blackberry man" after 1959 when he developed a method of using black plastic to cover a garden and planted through small holes. Because the plastic was used for up to 10 years, he called it "Gardening without Cultivation" and marketed his special formulated plastic sheets under that name. He also wrote a gardening book that has been printed in 7 editions. I did an internet search for Tom Doyle's book. I couldn't find a copy but I found This Web Page that revealed the book's title was Gardening Without Cultivation: "Plant and Pick." It was actually a 24-page booklet that Mr. Doyle sold through classified ads in magazines like Organic Gardening. Then I found This 1971 Article from Mother Earth News. As that article explains, Tom Doyle's plant-and-pick gardening system utilized a large sheet of 6-mil black plastic, with the perimeter edges buried in the soil. Rows of holes were cut into the plastic. The rows were 30" apart and the holes were 12" apart in the rows. The concept is simple. The only detail missing is the size of the holes. All we know is that they were "small." —Plant corn one gran to the hill. —Plant potatoes and sweet potatoes on the end of the garden where you can cut off their tops and roll back the plastic when it's time to dig them. —Plant peas early with 5 or 6 seeds to the hill. —Plant 2 beans to a hill. —Plant tomatoes 3 to 4 feet apart. —Plant melons 2 seeds to a hill, and thin to one plant per hill, 3 to 4 feet apart. —Plant lettuce several seeds to a hill and harvest the largest plants first to give the smaller ones a chance. —If you plant strawberries, use overbearing varieties and cover them with straw in the fall. —When a plant has fulfilled its usefulness, pull it up and plant something else in its place. —Be sure to plant a row or two of flowers. —Clear off the plastic in the fall in preparation for next year's garden. So Tom Doyle came up with a gardening system that allowed him to garden on a large scale (one acre, according to his biography) and have time to do a lot of other things in his busy life. He was, I assume, using solid plastic, not the more modern woven "agricultural fabrics." The solid plastic sheet would not allow air and moisture to get into the soil, but the new mulching plastic fabrics do. I've decided to try Tom Doyle's idea in part of my garden. I'm going to invest in a wide roll of the 8-to-12-year landscape fabric, like I've been using for the first time elsewhere in my garden this year. I won't use this idea for potatoes because I'm persuaded that to grow good potatoes, the soil must be mounded up, and, besides that, I have my potatoes planted already. Peas are in too, and I think I already have a better system for tomatoes. As for root crops like carrots, beets and onions, I don't understand how they would integrate efficiently into the hills-in-plastic system, so I'll stick to growing those crops in beds. But I'll use Tom Doyle's "plant and pick" system it to plant beans, chard, lettuce, kale and squashes. I'll let you know how the idea works out. In the meantime, if anyone out there knows where I can get a copy of Tom Doyle's booklet, please let me know. It took me awhile to find the download link at the web site, but it looks like the book may still be available. I'll find out. And it looks likek the "small" hole size is 3". That's smaller than I would have thought. Thanks again. If you go to this page, you can purchase it. I did! Thank you for the link. I did get a copy of the book. I should have done a review. I think the idea has a lot of merit but the book is not very good at presenting and explaining things, and I wouldn't recommend it. That said, as poorly written as it is, you can glean useful information from it. Thanks for posting the link.